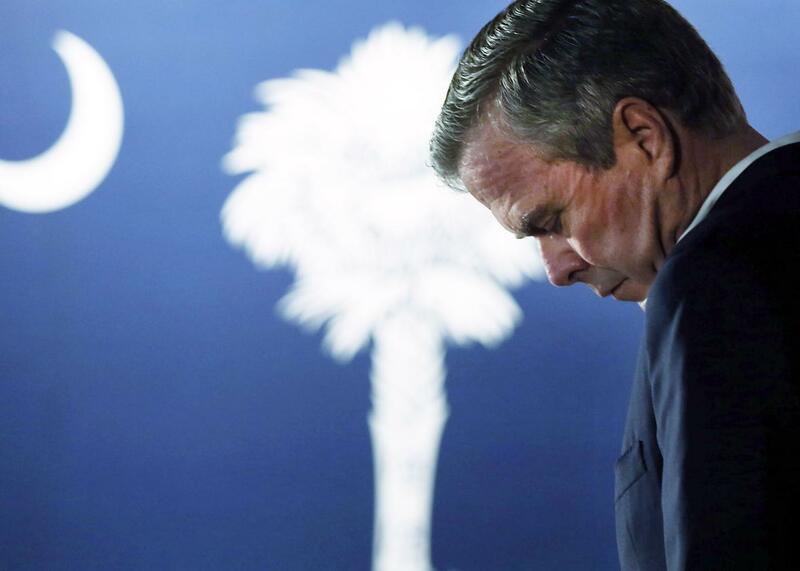 Jeb Bush drops out after loss in South Carolina. Jeb Bush speaks to an audience of voters on February 17, 2016 in Beaufort, South Carolina. Donald Trump won twice on Saturday night—first when he was declared the winner of the South Carolina primary, then again an hour later, when Jeb Bush announced he was ending his candidacy. Bush began 2015 as the de facto favorite for the Republican nomination, thanks to his family name and the vast sums he was able to raise because of it. But none of that seemed to matter in a campaign that continues to be dominated by Trump, who at times seemed as interested in making Jeb’s life a living hell as in actually campaigning. The billionaire delighted in branding Bush a “low energy” candidate, pointing out his lackluster polling, and criticizing his brother’s presidential legacy. Jeb was slow to realize the threat posed by Trump’s, um, nontraditional campaign strategy, and by the time he did there was little he could do about it. Trump wasn’t the only one who had a hand in Jeb’s defeat. Rubio, Bush’s former protégé, decimated him on the debate stage this past fall, creating the “Jeb is doomed” narrative that eventually became a reality. Bush was forced to compete in a crowded “establishment lane” with Rubio, Kasich, and (until recently) Chris Christie, the latter two of whom also touted their gubernatorial experience on the stump. And Jeb himself never quite decided whether to run towards or away from his brother’s record until it was too late. The big question now is whether Bush’s supporters—and donors—get behind Rubio en masse, or if some significant number go to Kasich, still coasting off his second-place finish in New Hampshire. Jeb could boost either candidate with an endorsement—though backing Rubio would be awkward given how often the two clashed on the stump, and boosting Kasich would cause an even bigger headache for the Republican Party. Regardless, Jeb’s exit gives his former rivals some much-needed space in the establishment lane. If Rubio can consolidate the support he needs to mount a serious challenge to Trump, the Donald might be left wishing Bush were still around.